July has drifted away, and a half of the summer is gone. 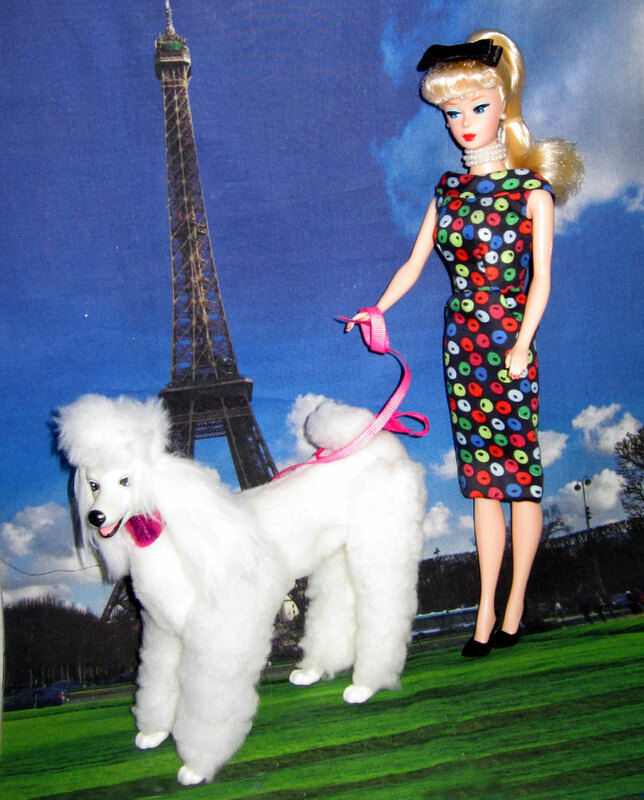 there is so little I can find in the Barbie signature shop, so I treasure-hunted on eBay, the apple print sheath and Prince the Poodle are 2 of the things I collected last month. I am very fond of Prince. perhaps I’ll get his sister “Beauty” in the near future. This entry was posted on August 1, 2018 at 12:49 pm	and is filed under Dolly Daily. Tagged: august barbie calendar 2018, barbie apple sheath, barbie easter parade, barbie poodle prince. You can follow any responses to this entry through the RSS 2.0 feed. Both comments and pings are currently closed. Ah, you make the nicest calendars, Helen….thank you once again! I trust your summer is going well. I feel bad that my July wasn’t productive. Becky! I wasted my time on YouTube. but I hope that’s going to change in August. lol–I said the same thing before, didn’t I? Thanks for liking the calendar –I like to choose a doll from the current collection, but I cant find one I love. I must say I don’t like all these Movie dolls.